Go ahead. Google “Italy agritourism.” I dare you. Scrolling through the thousands of hits will take you more time than you probably have today, or any day. I don’t know whether the Italians actually invented agriturismo—I’m still trying to piece together a more reliable sense of the genesis of farm and food tourism, which I don’t think anyone has really tackled yet in a solid historical way—but I do seem to keep finding Italian connections as I look at the topic. 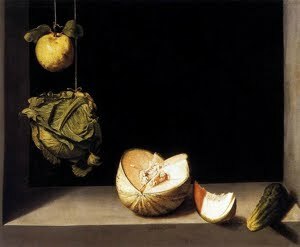 Farm-stay and food tourism in Italy—and all around the European coast of the Mediterranean—clearly evokes a particularly appealing version of la dolce vita for many people, and I thought I’d spend this post and the next one talking about one nineteenth century and one contemporary example of Italian images and ideas in the American landscape of farm tourism and preservation. The nineteenth century example is sort of subtle, and it didn’t really strike me until well after I’d finished my research on Martin Van Buren’s farm. 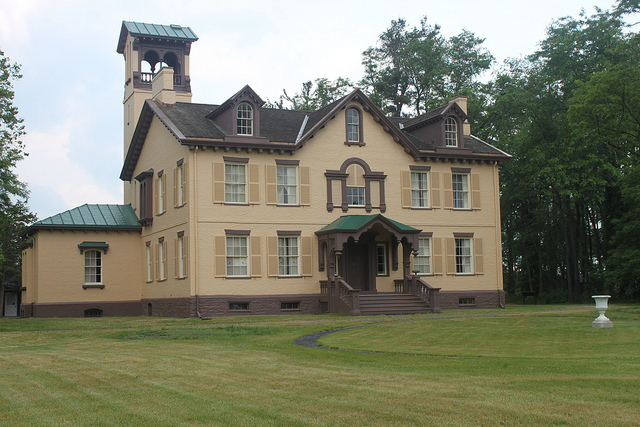 When Van Buren lost his Presidential reelection bid in 1839, he returned to his home in Kinderhook, New York, and bought a substantial farm. The property boasted a fine Federal-style house at that point, and Van Buren seems to have been quite satisfied with that. But he also wanted to see subsequent generations of his family settle on and cultivate the farmland. To that end, he gave his youngest son, Smith Thompson Van Buren, free rein to renovate the old Federal farmhouse, as a way of giving him a greater stake and sense of ownership of the estate. The strategy didn’t work; Van Buren’s sons sold the property within a couple of years of his death in 1862. But the 1849 renovation, by fashionable architect Richard Upjohn, is revealing about some of the visions of country living and farming that were circulating at the time. 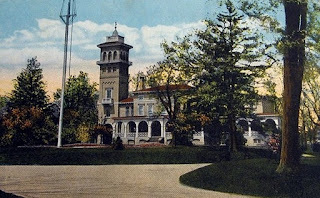 Upjohn was particularly known for his work in the Italianate style, which had emerged among elite landowners in England a few decades earlier and which reflected the widespread Anglo-American association of Italy with gracious, patrician, cultivated (yet passionate and earthy) living. Other styles—Tudor, Gothic, Elizabethan—superceded Italianate architecture in the U.S. not long after the Civil War. 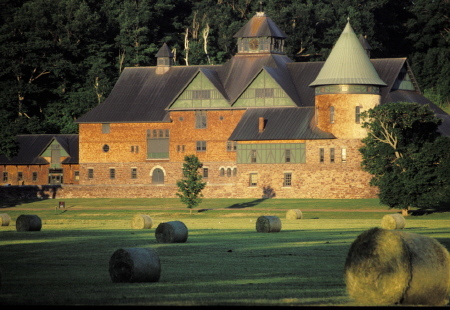 Many of the farm estates of the later 19th century (for example, Vermont's Shelburne Farms, at left) reflect the neo-medievalism that also prompted the Arts and Crafts movement and other efforts to invoke smaller-scale living and hand-crafted production. Each of them, of course, invokes an imagined and often romanticized past, but a more northern than southern European one. Those anomalous Italian towers dotting the American historic farm landscape hint at the role that Italy played in the imaginations of those—like Martin Van Buren and his family—who used their antebellum farms to express a vision of what cultivated country living could and should be. Next week: A more recent Italian-American patron of agriculture remakes a Vermont dairy farm for the postindustrial economy. Is a farm policy museum too wonky to work? One of the frustrations for small-scale farmers and food-sellers is the existence of massive amounts of state regulation that has developed over decades of increasing government involvement in the food system, often in response to abuses and problems within large-scale industrialized agriculture. The big growers and processors follow practices that create a higher risk of contamination--the 2006 E. coli outbreak in California spinach showed this in a high-profile way--prompting oversight and stricter rules that smaller farms have to abide by but usually can't afford. 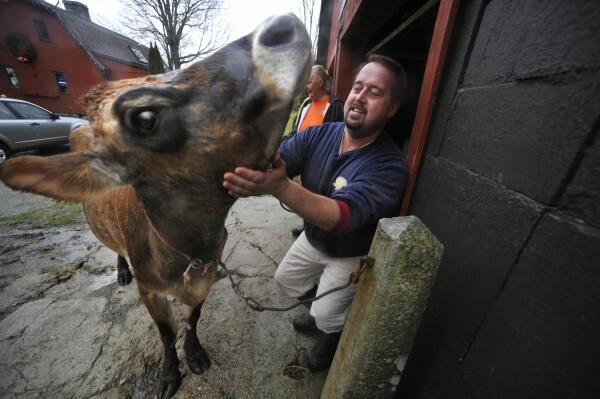 A case last month in Blue Hill, Maine, reduced this situation to its lowest denominator: a man who farms largely to feed his own family and sells what he doesn't need to his neighbors, all of whom know him and have to come to his farm to pick up what they buy from him. It's a mode of farming that was extremely widespread in this part of the world in the 18th and early 19th centuries (and sometimes far later, in places). As the farmer, Dan Brown, points out in a Bangor Daily News article, "This has been done this way for hundreds of years." It's the ultimate in direct marketing: the warrant for the food's safety comes from personal relationship and knowledge that the farmer himself is consuming what he (and his single cow, in this case) produces. Now, of course (you saw this coming), there's been a complaint about the unregulated nature of Brown's milk production and sales, and the state is pushing him to get a distributor's license and come under the official umbrella. Brown is digging in his heels and his situation is shaping up to be a potential test case in the pushback against big rules being applied to small farmers. The controversy over the selling of raw milk is at the forefront of this struggle, but the issue is larger than any single product. It goes to the heart of the differing economic and social visions and realities represented by small-scale production and direct marketing, on the one hand, and large-scale commodity farming, on the other. It also, it seems to me, has a lot to do with history--in this case, the history of how and why the state got so embroiled in the business of food. It's a real paradox of our food system that much of what's wrong with it--for example, the heavy hand of government regulation and the move toward mechanized production--is actually a result of well-intentioned people trying to keep farmers on the land and help them make a living in an economic system whose logic of efficiency and economies of scale is in many ways fundamentally at odds with what it takes to keep farms and farming viable. Knowing more about that history may not fix anything in the short term, but it could be a useful lesson in how easy it is to end up with unintended consequences when you're trying to sort out the uneasy (or maybe even unholy) marriage of agriculture and capitalism. What would a museum devoted to that history look like? And does one actually exist? A fairly cursory Internet search turned up the USDA's Agricultural Research Station National Visitor Center in Beltsville, Maryland, which closed last fall (possibly because only a few thousand visitors a year found their way there) and which seemed, in any case, to be in the standard mode of show-casing innovations and inventions rather than talking about agricultural policy in a larger sense. The National Agricultural Library, also in Beltsville, has a fabulous collection of materials, some of which are available online, but they're not in the exhibition business in the way that museums are. I didn't find anything that came close to what I'm envisioning here: a museum, or at least an exhibit, that illuminates the complicated history of state regulation and intervention in the farm sector, for better and worse. Policy history is kind of a tough sell, especially in competition with baby lambs and heirloom apples--but I'm thinking it would have a great deal of utility as we try to sort out how we got into a lot of the problems we're currently trying to get out of. What do you think? Too wonky to work? In last week's post, I wrote about why younger and beginning farmers might want to forge relationships with historic sites that have land and often a long history of cultivation of that land. And while I've got you on the line, new farmers, I’d like to make a case for how you might help to strengthen the museums and history-minded organizations who are your potential partners in preserving farmland and researching and rebuilding local and regional food systems. I'll cut right to the chase: I think that public history needs not only your critical savvy about how we might prepare ourselves for the changes and stresses of a changing climate and a more localized way of living, but also the improvisatory, do-it-yourself, open-source approach that you tend to take to life and work. That approach reflects the fact that you've come of age with the World Wide Web, which enables new kinds of sharing, collaborating, learning, and creating across distances and time. And while there's no shortage of digital enterprise going on in the public history world, I have to say that I don't think the collective inventiveness and open-endedness of this mindset has really permeated the field yet. That's where you might play a role. I see this new mindset sprouting up all around the local food movement. It's exemplified by the Crop Mob, a kind of new-fashioned work bee that responds to the demographic and economic changes in farming over the past century. How do you harvest your potatoes or move your giant compost pile when you don't have 11 kids or a handy local workforce of seasonal farm laborers? 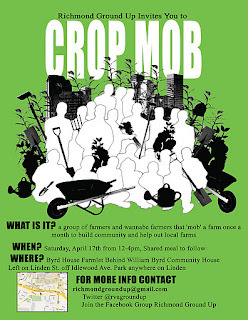 Put out a call to your network of like-minded young agrarians, who will come help you out in exchange for a good meal at the end of the work session and the promise of reciprocal unpaid labor when they need it. Digital communication is key to making a Crop Mob work, in addition to spreading the idea beyond its origins in the Triangle area of North Carolina. Groups like Food + Tech Connect are beginning to marry this approach to research and public education about the food system, as they do most notably in their Farm Bill Hackathon. A hackathon is a gathering of geeks to work on some specific task: building a tool, writing a piece of code, or, in this case, turning the wonky data of the Farm Bill into accessible narratives and graphics. Like crop mobbing, the Farm Bill Hackathon emphasizes doing--gathering a variety of people to engage directly with complex information, make something useful out of it, and then use those products as a step toward making social and economic change. It also emphasizes open rather than proprietary knowledge creation--a democratization of data that public historians should embrace. The new generational mindset--what one farm visionary is thinking of as Agriculture 3.0--even shows up in heartening ways in more traditionally commercial ventures, like a two+ minute ad for the (healthy) fast-food chain Chipotle. Chipotle emphasizes its non-factory-farmed ingredients, and the ad is a mini-history of the industrialization and nascent reinvention of agriculture. A pig farmer expands and mechanizes his business, only to end up seeing his pigs being compressed into big pink food cubes on a factory conveyor belt; after a dark night of the soul (above), he goes back to older methods, selling to Chipotle rather than to a faceless food processor. Like the Farm Bill Hackathon, the Chipotle ad distills a lot of information into a narrative that is over-simple in some ways but not without nuance. For example, it hints that factory farming was the product as much of farmers' desire to improve their operations as of evil corporate profit-seeking. As one of the ad team puts it in the "making of" video, the farmer "ends up with this factory farm out of having good intentions or wanting to...build a successful business"--an important point to remember as we try to figure out how to dismantle or resist the industrialized food system. 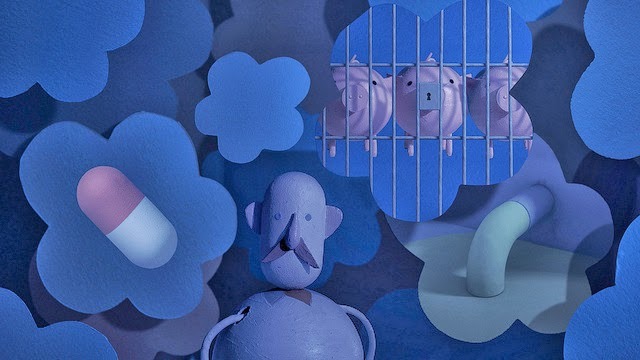 The ad itself also has a DIY feel to it, and although it was accomplished with highly sophisticated equipment, its stop-motion animation using handmade figures is the kind of thing that could easily be done with less high-end tools and disseminated in less high-budget ways. There's a long history of Americans seeing the next great technology as the solution to the problems of the previous ones, so I don't want to oversell the potential of the Internet, which is already turning out to have downsides of its own. But one of the exciting things about it is how well it combines with older, retro, and muscle-powered technologies. Young farmers' use of digital technology gives me hope that this may be a much more selective adoption of the latest new thing than some of the earlier attempts to revitalize small-scale farming by maximizing its efficiency through mechanization. This strikes me as more akin to how Amish and Mennonite farmers have approached technology: with a careful eye on how it might maintain and enhance community rather than unraveling it. And the whole combination strikes me as just what a lot of historic sites have been looking for: a way to expand their publics, share and aggregate the knowledge they've collected, and strike a healthy balance between tech-savviness and an insistence on the importance of tangible places and experiences. I'm not proposing anything specific here, which is sort of the whole point--I'm just thinking that if young farmers brought their inventive crop mob mentality to farming and learning at historic sites, and if public historians embraced that do-it-yourself ethos with a trifle more abandon than we tend to see in the field, some very exciting things might start to happen. 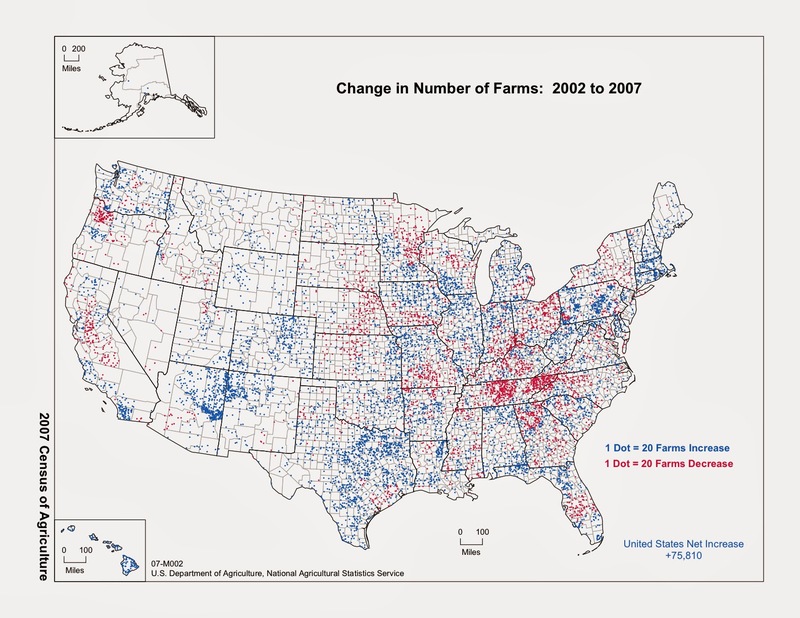 Blue dots show an increase in number of farms, 2002-2007. Happy New Year to all, and especially to the new farmers who have recently begun to reverse the very long decline in the number of farms and farmers in parts of the U.S., while also starting to counter the continually rising median age of farmers (a sobering 57 nation-wide in the last agricultural census). The growth of organizations like the Greenhorns and programs like CRAFT and countless other formal and informal mentoring and apprenticeship projects reflect the numbers of newer, younger farmers in heartening ways. You’re smart, you’re strong, you like good food, and you give me hope that we might actually be building real networks that can help us collectively to withstand the various environmental and economic shocks that continue to come our way. While I’m in this New Year’s mood, I thought I would frame my next two blog posts as an open letter to the new farmers of the past decade or so, to ask (with apologies to John F. Kennedy) both what historic sites might do for you and what you might do for historic sites. Let me start with the first of those. The first thing to know about historic sites is that many of them have land—maybe not much, but it’s often land that was farmed and/or gardened in an earlier incarnation, and that might be farmed and/or gardened again, if it isn’t already being cultivated. My Links page includes examples of the growing number of historic sites that already partner with working farmers, but I know there are lots more out there that could try the experiment. Usually, historical organizations have all they can do to raise enough money to keep their facilities open and their (often minimal) staffs paid. Don’t tell them I told you, but most of them are, in fact, as financially strapped as you are. They don’t generally have the time, personnel, or expertise to cultivate fields and gardens as well. So think about whether there are sites near you that might welcome a proposal to revitalize a big kitchen garden or pasture some livestock. There are legal and logistical issues to be worked out, but also synergies to be discovered. Some of those synergies have to do with the collections that are stored and the historical knowledge that’s produced at historic sites. Particularly if the site in question focuses on pre-20th century history (and most historic sites do), there’s a strong likelihood that its history includes some connection with farming somewhere along the line, even if that’s not its main reason for being preserved. A lot of historic sites work hard to show that they’re relevant on more than a purely local scale, but really, they’re all about localness as well. They can tell you a lot about who farmed what here, when, and how. You might have to get them started with some specific questions that are of interest and use to you, and you might end up helping to dig for the answers yourself in the slow season (warning: this can be surprisingly addictive). The payback: you deepen your own sense of what’s possible on the land you’re farming and what kinds of networks of exchange that farmland has been part of over time. And finally, there’s another way that I’d love to see you using the kind of historical knowledge stored at historic sites. I admire and applaud you, new farmers, but I also worry about you, because we’ve been here before, and the combined creative energies of agricultural reformers and back-to-the-landers in the 1970s, and the 1910s, and the 1820s, for that matter, weren’t enough to withstand the juggernaut that is industrial capitalism. I want the good demographic news about the growth in new farms from the 2007 agricultural census to show up in the 2012 data as more than just a blip, and to keep getting stronger in 2017 and 2022 and so on. And I think that if that’s going to happen, you’re going to need to know about the successes and—more importantly—the failures of earlier attempts to keep rural places vital and small-scale farms afloat. So if and when you start talking with local historic sites and perhaps even cultivating some of their land, make sure to ask them about that, okay? You may find—as I found when I investigated this kind of question at Martin Van Buren’s old farm estate in Kinderhook, NY—that the same kinds of reformers who were trying to fix rural life and keep young people down on the farm were also involved not only in the creation of the kinds of model farms that we now often visit as museums, but also with historic preservation and land conservation efforts as well. There are things we can all learn from their experiences, and those of other, less elite reformers, that might help make this latest reinvention of the farm economy a more lasting one. Next week: How you can help with the hacking of farm history.